I am wrapping up a pretty awesome semester as a college writing teacher and a terrific year as the director of a National Writing Project site. Yesterday as I sat in a computer lab watching my Peer Writers lead sessions for our Super Saturday Writing Camp in between stints of reading my students’ blog posts, I heard one of our NWP teachers comment how refreshing it was to spend the day watching kids just having fun with writing. Then I opened my email and read with a sinking heart a note from a parent about why her daughter, who had eagerly planned to attend our writing camp, had opted to stay home and prepare for the standardized tests scheduled for the following week because there was so much emphasis on testing at her school. This juxtaposition of events really made me think. Our Super Saturday Writing Camp generated so much energy and excitement but there were still teachers overburdened and downtrodden and there were still students giving up growth and learning in the interest of assessment. This morning my minister discussed the issue of “food justice” and why we, as Christians, must feed the hungry. He began by discussing Maslow’s hierarchy of needs but leaving us with the ultimate question: “What did Jesus do?” The answer: he fed the hungry. While this sermon moved me as a person and a Christian, it also really made me think as a teacher and a mother. What about education justice? How can we expect children to learn, to grow, to develop into the people that our community, our society, our world needs when we do not meet their most basic needs? A recent opinion piece in The New York Times, “No Rich Child Left Behind,” addresses the issues of the bottom half of Maslow’s hierarchy of needs and these are issues that we should all be concerned about if we truly want a better world, but what I want to talk about are those needs in the upper half of Maslow’s hierarchy, specifically the issues of self-esteem and self-actualization. The preparation for, dedication to, and recovery from the standardized tests which will dominate the remainder of the school year for most Kentucky students (and has already for weeks if not months) do nothing to foster the growth and development of our children. If anything it destroys their confidence and hinders their personal growth as well as stopping any real attempts at learning. It is all about test prep and there is little that teachers can do about it at this point. They are caught up in an educational rip-tide and they must ride the current or risk drowning. This is why the work of the National Writing Project in general and my site, the Morehead Writing Project, in specific is so important. We can work to change the system but changing the monolithic United Stated education system is a slow process. However, what we really need to do is to remember our primary mission, our primary goal, and stay true to that – we need to feed the writer. There is little we can do about the big picture in the short term, but we can offer our teachers and their students a respite from standardized-testing mania and we can feed the writer to sustain them through these troublesome times. I believe remembering that simple truth is what has made this such a successful year for our site. We jettisoned programs that didn’t feed that mission and focused on offering opportunities for our teachers and their students to write, to share, to learn. Our Writing Eastern Kentucky Conference kicked off the day with a poetry slam and included ample opportunity to write and to share throughout the day; our Teen Writers Day Out was a writing marathon enjoyed by high school students and their teachers plus members of the Morehead State University community; and most recently our Super Saturday Writing Camp was a day filled with writing and sharing with young writers. Recently, I felt guilty because two different teachers in our region asked our site to lead test preparation professional development and I turned them down. At the time it was simply a matter of not having the time to take on one more task (think straws and camels) but now that I have reached this epiphany I am glad. I don’t want our site to contribute to the problem. I don’t want my teachers to take on one more task (when I know their own camels are already overloaded) that won’t bring them respite or joy. From now on, our primary goal, our only goal, is to feed the writer. 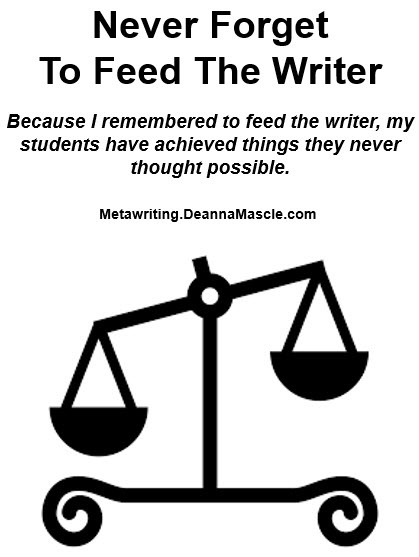 And that is also what we need to remember as writing teachers – we need to feed the writer. I have had so much fun with general education writing class this semester and shockingly so have my students (or so they say). We have met all our student learner outcomes and required assessments, but together we created a supportive community of learners pursuing a number of interesting projects and ideas. I get a little misty-eyed whenever I think about what we have accomplished together and what my students have achieved – ultimately because I remembered to feed the writer as I designed the class, assignments, and activities. Because I remembered to feed the writer, my students have achieved things they never thought possible. How do you feed the writers and teachers in your life?